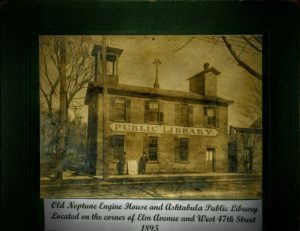 The Ashtabula County District Library System began as a subscription library association in Ashtabula City in 1813. It was incorporated in 1896 as the Ashtabula Free Public Library. The building located on 44th Street was built in 1903 as the “Carnegie Conklin Library”, with funds both from Maria Conklin’s bequest and from Andrew Carnegie. A change in State Library law permitted the Ashtabula Free Public Library to become a county district library in 1953. An addition was added in 1958 and a new entrance and elevator in 1984. During a million dollar remodeling project, a fire destroyed the second floor. The library, relocated for eighteen months, received national exposure from a syndicated Chicago columnist, who wrote a column to his readers about the fire. As a result, over 30,000 books were donated from all over the United States. The renovated building was reopened in March of 1992. 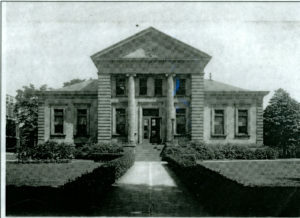 A permanent site for the Geneva Free Public Library was secured in 1910 with funds from Andrew Carnegie and the Platt R. Spencer Memorial Association. Prior to that date, library service for the Geneva area had been housed in several locations around Geneva dating back to approximately 1830. An addition was added in 1939. In 1955, the Geneva Public Library joined the Ashtabula County District Library system. An elevator and new restrooms were added in 1984. A new addition was added in 1989 to house the County Bookmobile. In May 1995, a bond issue was passed by the citizens in the Geneva Area City School District to construct a new Geneva Library. This new facility is located on Sherman Street and opened in June of 1997. The County-wide Bookmobile service began in 1958 and was a result of the previous extension service offered by the Ashtabula Public Library. The Bookmobile serves county residents in those areas not covered by local libraries. Locations in the county include nursing homes, community sites, schools, and senior housing units. A Literacy Office, established in conjunction with the Literacy Volunteers of America / Ashtabula, Kent State University, and a Title VI grant, was opened in 1985. The office became the Ashtabula County Literacy Coalition and is located at Kent State University Ashtabula Campus Library. 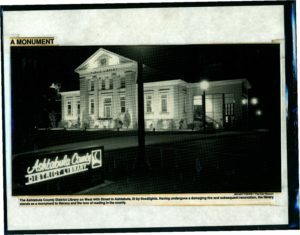 From 1993 through 2008, the Ashtabula County District Library was also a member of the Council of Ashtabula County Libraries , which passed, in 1993, a levy to automate the eight individual Ashtabula County libraries. The project to automate the Ashtabula and Geneva Libraries was completed in Fall of 1996, and the County Bookmobile was automated in the Summer of 1997. In 2007, a new Bookmobile hit the roads of Ashtabula County, bringing books, videos, and programs throughout the county. 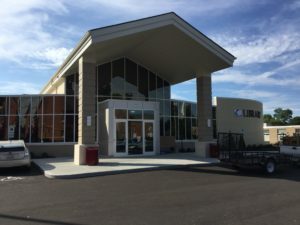 In fall of 2013, the Ashtabula County District Library passed a levy to support and expand its operations and help offset cuts at the state level. Library funding is currently set at 1.66% of the State’s total general tax revenues. ACDL’s current budget is about 51% from the State’s public library fund (PLF) and 49% from our 10-year levy. 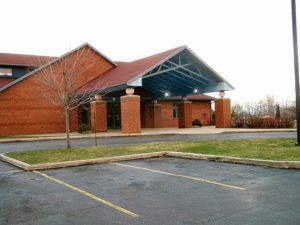 In fall of 2014, the Board approved a project to expand the existing library in Ashtabula and renovate the Geneva building using a plan developed by Ziska Architecture of Cleveland. Construction broke ground on the Ashtabula expansion May 18, 2015 and we celebrated our grand re-opening on September 11, 2016. Today, ACDL serves approximately 57 percent of the county’s total population. It is governed by a Board of seven Trustees — three appointed by the Judges, Court of Common Pleas and four appointed by the County Commissioners.